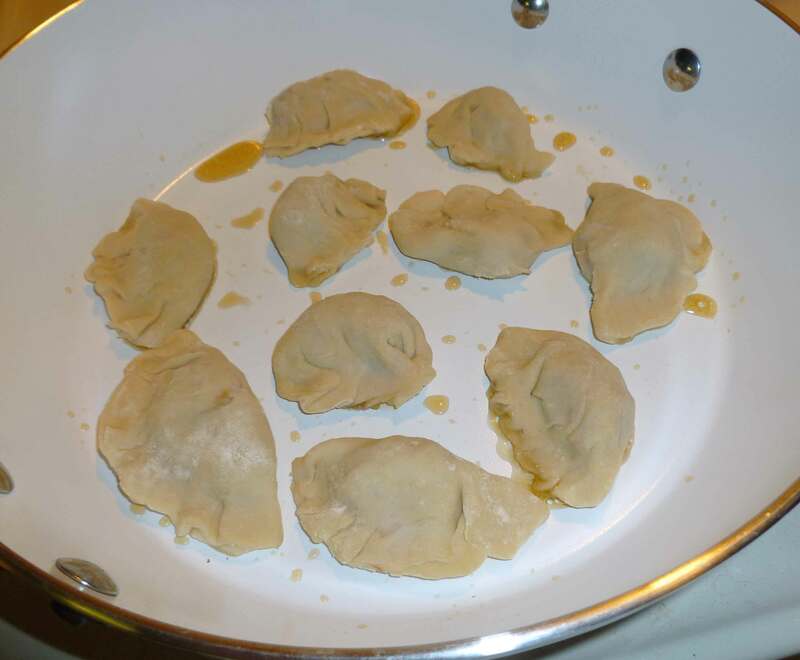 Before the food allergy apocalypse hit, one of the things I really liked to do was to make my own Peking Ravioli (aka Potsticker, Wonton, Gyoza, etc.) or whatever you want to call your basic Asian style dumpling. Apparently you only call them Peking Ravioli if you live in the Northeast because that was what Joyce Chen called them in her restaurant in Boston in the 1950’s–the things you learn when blogging. But in the before times, in the long, long ago, I liked to make them by buying pre-made wonton wrappers at the grocery store, which, at least for the grocery stores in New Hampshire, all contain egg. So I thought I’d try to come up with a gluten free vegan wrapper so Mary Kate could eat some too. (I can have wheat, at least for now. More food allergy testing later today. Please cross your fingers for me that they don’t find any more food allergies, and if they do, it’s an easy to avoid one like a fruit.) My gluten free vegan dough attempt was pretty much a spectacular failure, and it’s going to take some more research and some more work, but I’ll keep trying. At the same time, I had decided to try an egg free dough that I had found using all purpose flour (warning: I mean a real wheat flour) and boiling water, because I knew I was going to have too much filling, and I like to do a lot of experiments at once because you’re more likely to have at least one success. The egg-free real wheat flour version worked. Again, I promise to keep trying for a gluten free version. Anyway, the really nice thing about this recipe is that you can make a bunch of them up, put them on parchment paper on a cookie sheet (this is prior to cooking them), making sure they don’t touch and then throw them in your freezer on the cookie sheet until they are frozen solid. 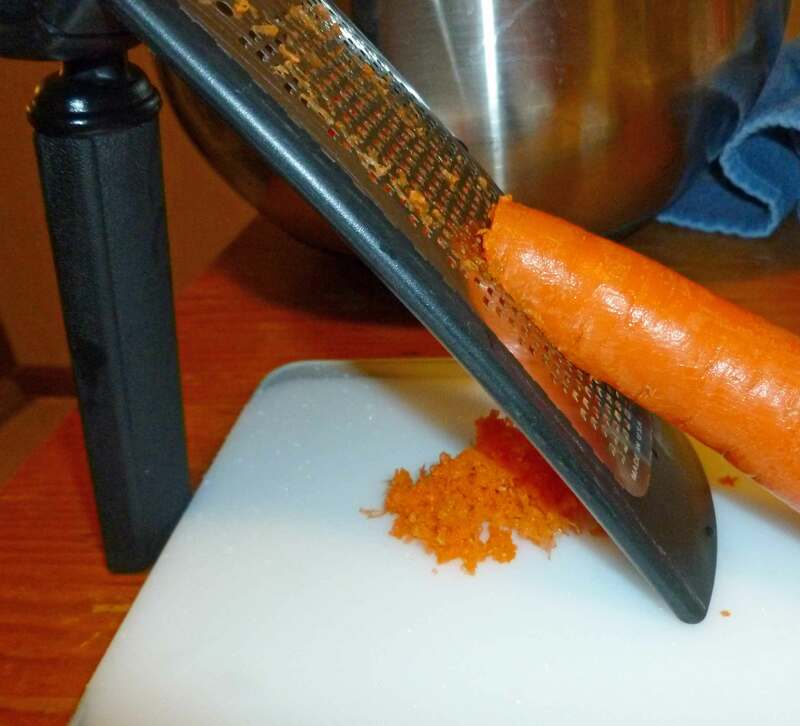 Then you can pop them into a ziploc freezer bag, and you can take a few out here and there to use whenever you want, to steam, to pan-fry or to put in soup, because they’re not frozen together in a lump. It’s labor intensive for an afternoon on the weekend, but then you’ll have lots and lots of dumplings for whenever you want! 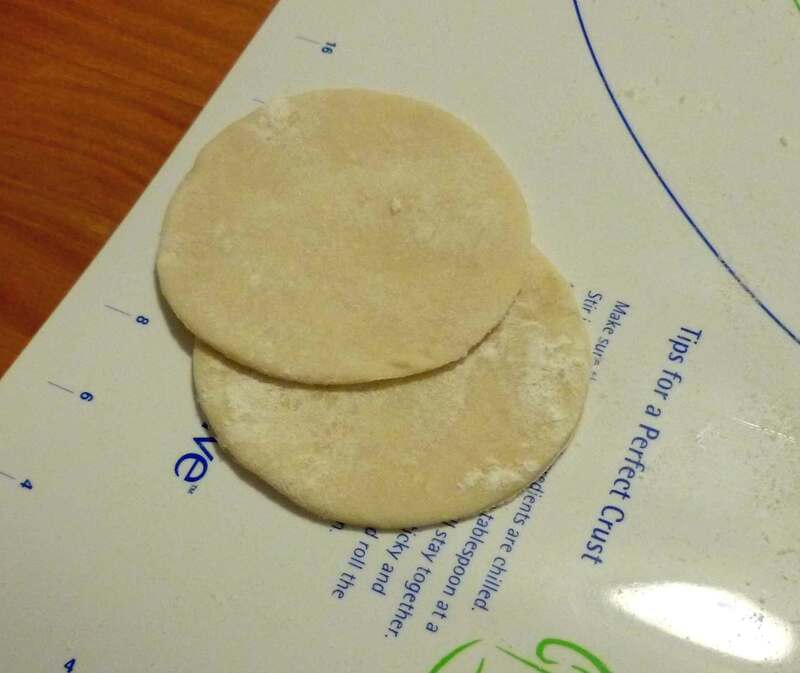 Makes about 35-38 dumplings if you roll out your wrappers to 3 inches in diameter and to an 1/8 of an inch thick. To make the dough for the dumpling wrappers, I used my stand mixer with a dough hook, but you can just use a bowl and a spatula too. Place the flour in the bowl and mix the boiling water in slowly until the dough forms a ball. If using a mixer, continue on low speed to knead it for a few minutes. If using the low tech method, knead it with your hands for a few minutes. Shape it into a smooth ball and place it in a ziploc bag to rest a bit while you make the filling. 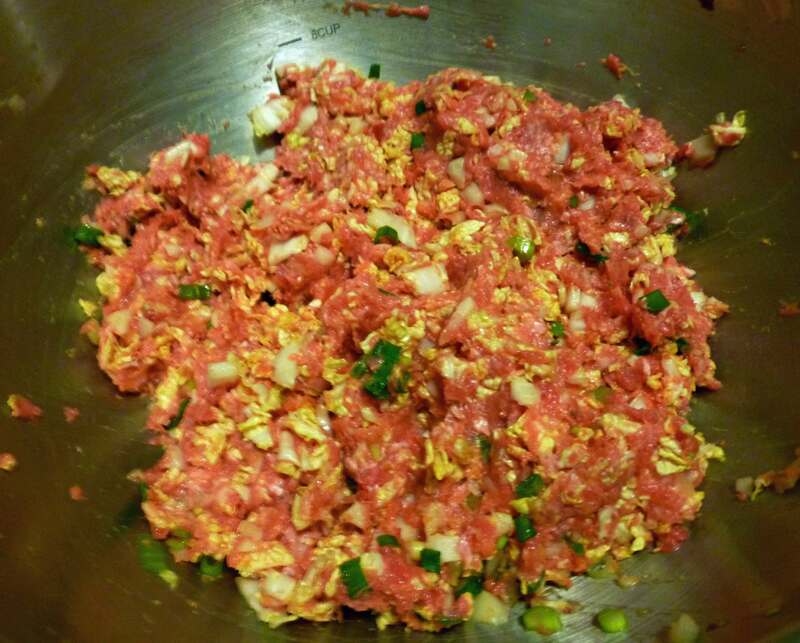 Place ground pork, garlic, carrot, ginger, green onions, Nappa cabbage, water chestnuts, soy sauce, sesame oil, rice vinegar, chili garlic sauce, cornstarch, and salt in a bowl, and mix throughly using your hands. You might want to put it in your refrigerator while you roll out the wrappers. Now it’s time to make your wrappers. You can roll out your dough on a very clean counter top, a dough rolling mat, or a cutting board. I used a rolling pin and a biscuit cutter which was three inches in diameter to make the wrappers. Spread some flour over the surface of your work area. This dough is very sticky, you’re going to need quite a bit of flour for dusting, and it’s much easier to do it in small pieces. I only rolled out enough dough to cut out 2 or 3 wrappers at a time, as any larger attempts stuck to the mat too easily. Take a piece of the dough about the size of a plum, and using your flour to dust liberally, roll the dough to about an 1/8 of an inch thick and use your biscuit cutter (cookie cutter, or even a water glass in a pinch) to cut out the wrapper. Take your scraps and a bit more of the dough, and knead them together a bit and roll out a couple more wrappers. Keep doing this until all the dough is gone. Again, this dough is very sticky, make sure you dust them liberally before putting them in a pile. I didn’t and I had several wrappers stick together, which I then had to roll out again when I tried to use them. 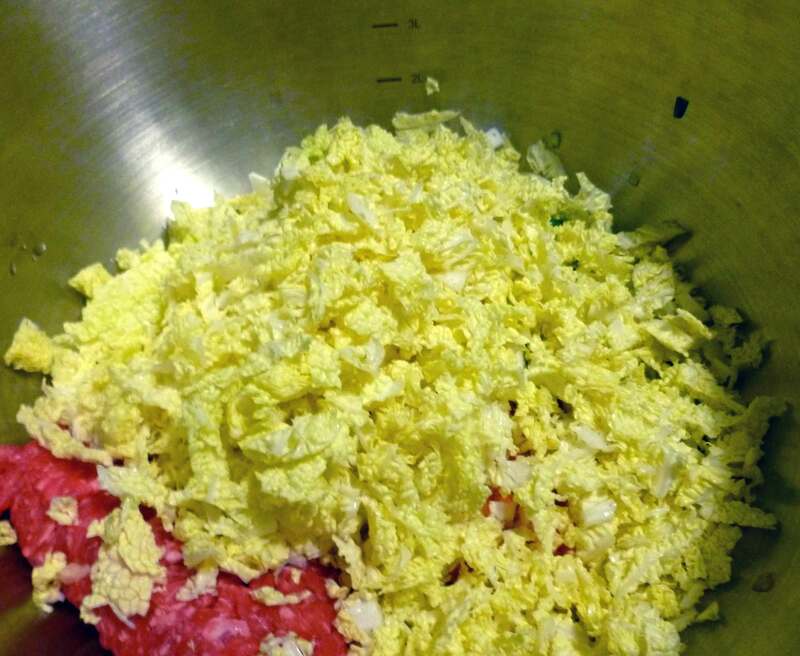 Now it’s time to make your dumplings. I just want to say that this is a much softer dough that your usual wonton wrapper you get from the grocery store, and it’s harder to get a “pretty” result. And I’m not an expert by any means. So go check out this video by an expert for different shapes and techniques if you need a better explanation than the one I’m about to attempt. Especially once you see the picture of my completed ones below. Take a wrapper, hold it open in the palm of your hand. Place about a teaspoon or so of filling in the center of the dumpling and fold up the sides of the wrapper, pinching it shut, making little pleats if you have that kind of dexterity. 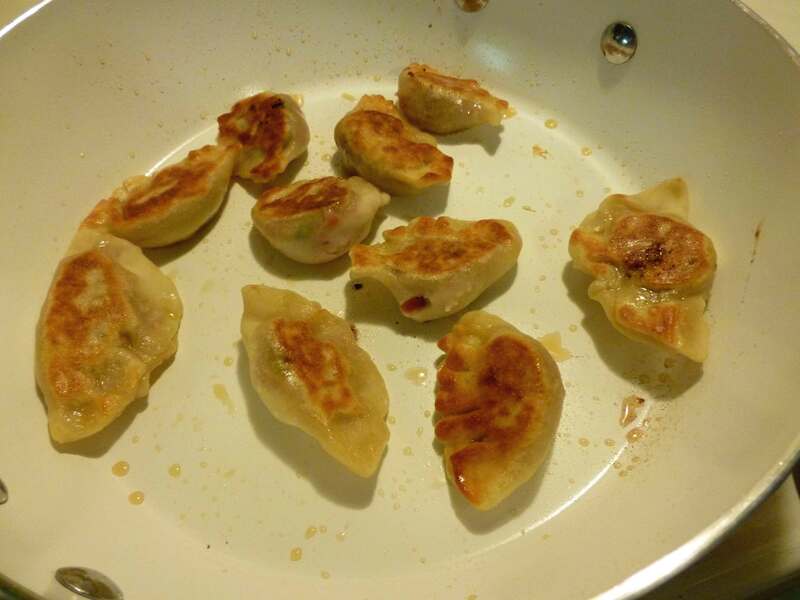 Pan-frying Dumplings: Place a little sesame seed oil in a skillet (which must have a tight fitting lid) over medium heat. 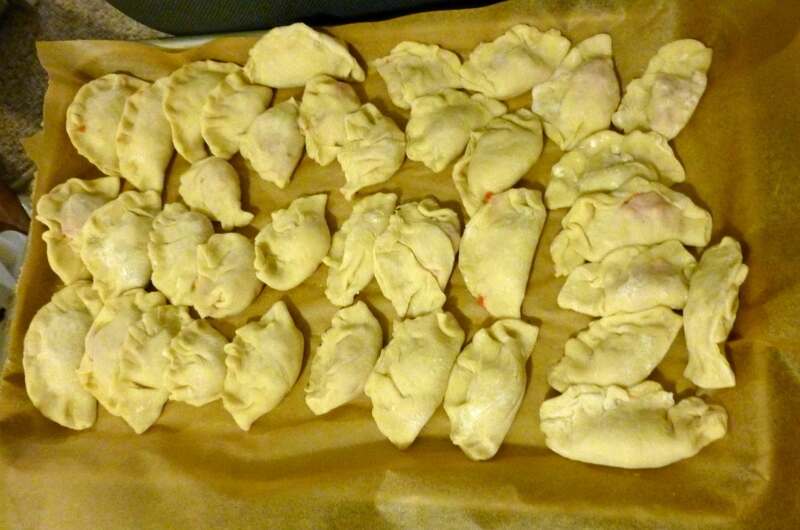 Add dumplings, but so that they do not touch and have enough room to cook separately. Once both sides are golden brown, add a quarter cup of chicken stock and put the tight fitting lid on the skillet. Continue to cook over medium heat while dumplings steam from chicken broth for another 3 – 7 minutes (depending on whether they were fresh or if they were dumplings you froze to use later) making sure to test one to see if they are done before serving. You may need to adjust your cooking times. Continue to fry and then steam dumplings in batches until you have cooked all the dumplings you intend to serve. Serve with dipping sauce. Steaming Dumplings: Use a metal steamer basket or a bamboo steamer in an appropriate size pot with a tight fitting lid with enough water so that it will not touch the dumplings. Place the dumplings in a single layer in the steamer. Bring the water to a boil, then reduce the heat to medium and put the lid on the pot. If the dumplings are freshly made, cook for 5 minutes or so, but test one to see if they are done before serving. 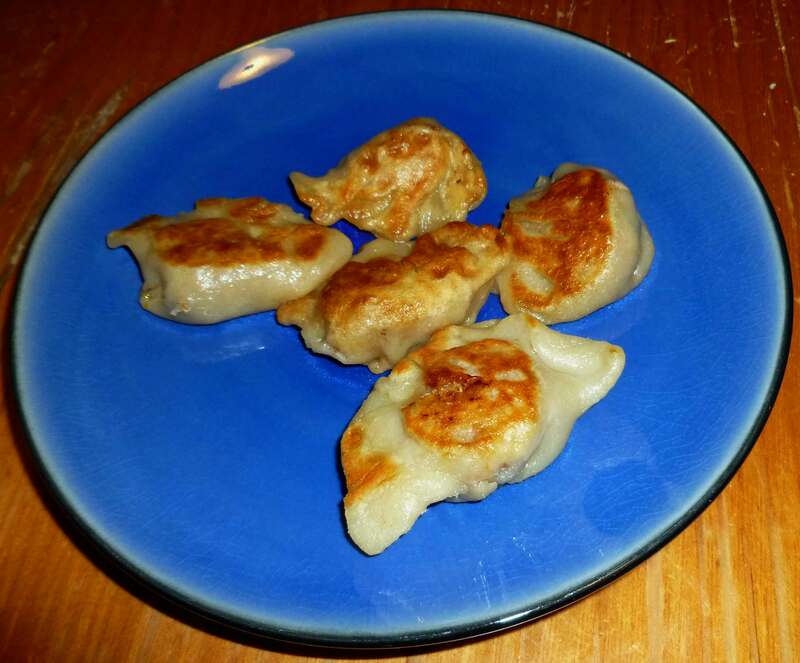 If you froze your dumplings to use later, don’t thaw them, but cook them for about 15 to 20 minutes, testing to see if they are done before serving. Serve with dipping sauce. Dumplings In Soup: You can do a quick wonton soup, using some chicken broth, some green onions, some Napa cabbage, thinly sliced carrots and some of your dumplings. Bring the chicken broth to a boil, add the dumplings and carrots, and then reduce the heat to medium. When the dumplings and carrots are cooked, add the green onions, Napa cabbage and cook for a minute or two more. I like to add some white pepper or Chinese Five Spice to season it as well. This is a really quick dinner if you’re using dumplings you froze to use later, and some frozen homemade chicken stock, or a store bought version (checking the labels of course). Hope you like these, and I will keep trying for a gluten free version I like to share.